As we know, the Roman Catholic Church and the Eastern Orthodox Church are separated from each other, and have been so for almost a thousand years. But this means that they were one for close to a thousand years with some temporary schisms during that time. This one-time unity has many dimensions. One dimension is that many of the saints of the first thousand years are venerated by both the Roman Catholic and Orthodox Churches. For example, there are many popes who are commemorated on the Orthodox calendar, as well as Archbishops of Canterbury. St. John of Shanghai and San Francisco, a twentieth century wonder-worker, when he was bishop in Europe and later in America, strongly encouraged the Orthodox to remember and celebrate the memory of these western saints of the first millennium to remind us that Orthodoxy is not a religion only for certain nationalities or countries, but for all people. Today the Orthodox Church celebrates the memory of the Venerable Bridget (also spelled Brigid or Bride) of Kildare, an Irish nun who lived c. 453 to c 524. Her mother had been baptized by Saint Patrick, Enlightener of Ireland. She herself was a friend of St. Patrick. At some point she became a nun and in 480 she founded two monasteries in Kildare, one for men and one for women. She also founded a school of art, teaching metal work and book illumination. St. Bridget, as Abbess, had a great deal of influence on monasticism in Ireland. She fell asleep in the Lord on February 1, 524. 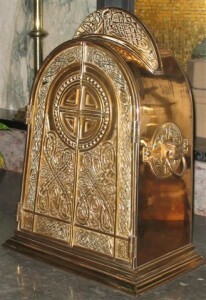 St. Bridget’s relics had been housed in a church in Lumiar, a suburb of Lisbon, Portugal. In 1929 a small portion of her skull was brought back to Ireland and placed in a reliquary in the cathedral in Killester, near Dublin. At the time it came as a great surprise to the majority of Irish people that this relic existed, and even more so that it had been preserved in Portugal, where for hundreds of years the Portuguese had venerated her. The life of St. Bridget and countless other saints of the first millennium remind us of a lost Christian unity, which we should pray and try to overcome, so that the unity among Christians which Christ willed is restored. This entry was posted in Church Services, Sermons on January 31, 2015 by gldstrm. There is a tendency to think that the Liturgy of the church is something that the clergy and that lay people are passive. But this is not true. The Liturgy is something done by clergy and laity together. The priest chants or reads prayers, the choir sings and the people sing or recite prayers. For example, the Creed, the Our Father, Lord have mercy, or the prayer before Communion. People send in prosphora with lists of names to be prayed for. Of course the laity light candles and pray for people on their own. This shows that the laity participates in the Liturgy and in the Orthodox Church a priest cannot serve the Divine Liturgy on his own; there must be someone else present. ​This is reflected in today’s Epistle (1 Corinthians 12:7-11) taken from St. Pau’s first letter to the Corinthains. St. Paul writes: “…the manifestation of the Spirit is given to each one for the profit of all (1 Cor 12:7)” And then St. Paul points out the different gifts of the Spirit; some people have the gift of wisdom, others knowledge, still others may have the gifts of prophecy, healing, miracles and so on. But we see that there is no clergy/laity division here. We all have gifts of the Spirit. St. Paul continues “…one and the same Spirit works in all these distributions to each one individually as He wills.” So all Christians have gifts of the Spirit and all of us are necessary for the church, not only in the celebration of the Liturgy but in the whole life of the parish, diocese and national church. St. Paul writes “A charism is a gift of the Holy Spirit given for the benefit of others. But no one person possesses all of the gifts (1 Cor 12:11 – Orthodox Study Bible, pg. 395)” So we see that the life of the church is a synergy, a working together of God and the believers and a synergy of clergy and laity. This entry was posted in Church Services, Sermons on January 23, 2015 by gldstrm. Most people even if they are not Christian have a favorable view of Jesus Christ (although we remember the hatred of Christianity in the Soviet Union and other places). Many people will acknowledge Jesus as a great moral teacher, a highly spiritual person and so on. These things are true, but the fundamental Orthodox belief is that Christ is God, the second person of the Holy Trinity. Athanasius proclaimed the Nicene Creed, forcefully taught that Jesus Christ is “true God of true God,” which has been the belief of Orthodox, Roman Catholic and many Protestant Christians since his death. He is known as one of the great defenders of Orthodoxy. This entry was posted in Church Services, Sermons on January 17, 2015 by gldstrm. Two of the readings for January 20th are Wisdom of Solomon 3: 1-9 and Luke 6: 17-23. Though one is from the Old Testament and the other is from the much later time of the New Testament, they both tell us that the “now” of the present life is a passing reality. The “then” of eternity, and its everlasting reality, is what matters. In the passage from Luke, often called the Sermon on the Plain, Christ Himself tells us that this world’s painful difficulties fade into nothing when we know the glory of the future with God: “Blessed are you when men hate you, and when they exclude you, revile you, and defame you on account of the Son of Man. Rejoice in that day and leap for joy, for surely your reward is great in heaven; for that is what their ancestors did to the prophets.” Not only does Christ reassure us about our own lives; He also reminds us that others—such as the righteous people described in Wisdom of Solomon—experienced the same things. 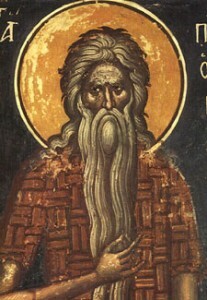 On this day the Church honors the New Martyr Zachariah of Patras, who lived in the late eighteenth century. He was born a Christian, but converted to Islam. Living as a Muslim for many years, he still kept and read a book called “The Salvation of Sinners.” The book’s powerful words finally convinced him that he had made a dreadful mistake. Zachariah publicly declared his intention to return to Christianity, having received absolution from a Christian elder. For this he was tortured so severely that he died. When the local Christians asked permission to bury him, the Muslim ruler said he was unworthy of burial, having betrayed two faiths. His body was dragged through the streets and unceremoniously tossed into a dry well. Yet people approaching the well saw an unearthly light shining above it. This man, who in life was pronounced unfit even for a proper burial, had found the “then” of God’s forgiving and welcoming love. This entry was posted in Education, Sunday to Sunday with DCE on January 17, 2015 by gldstrm. January 15 is the feast day of Venerable Paul of Thebes. The region of upper Egypt in which he was born about 227 is called the “Thebaid” because it is near the city of Thebes. It’s a desert area, and over the centuries it became the dwelling place of thousands of monks seeking to come close to God. Paul was raised and well-educated in a loving Christian family. Orphaned as a teenager, he had no adult protection when imperial Rome began severely persecuting believers. He took refuge with friends. One of the Roman government’s ploys was to offer large rewards to people who turned in Christians who were hiding. Paul’s greedy brother-in-law planned to give his name to the authorities, despite the tearful pleas of Paul’s sister. Being warned of this, and wishing to spare his sister grief at her husband’s treachery and his own arrest, Paul fled to the mountains. At first Paul thought his time in the wilderness would last only until the persecution abated, but he found that he liked his new life. He went deeper into the desert, and discovered a large cave. Outside it was an ancient palm tree, with fruit for food and leaves for a garment. There was also a running stream. The cave became his home for the rest of his life, which lasted well over a hundred years. When we think of the first person to pursue a life of prayer and fasting in the desert, we may remember Saint Anthony the Great. Tradition tells us that Anthony, living in another solitary place, also had the thought that “no monk more perfect than himself had settled in the desert.” These words are from the life of Paul written by Saint Jerome in the fourth century. Saint Jerome writes that Anthony had a vision in the night that “there was farther in the desert a much better man than he, and that he ought to go and visit him.” Though already ninety, Anthony set out to find this elder. An arduous journey finally brought him to Paul, and the two conversed for a whole day and night. As Anthony reluctantly prepared to leave, Paul asked the younger man to bring the cloak he’d been given by Saint Athanasius to use as Paul’s burial garment, for he would die soon. Anthony was amazed that Paul had heard of Athanasius and the cloak, but he did as Paul asked. When he had buried Paul, he took the elder’s simple garment of palm leaves, and for the rest of his life honored “the first hermit” by wearing it only on Pascha and Pentecost. you were the first to dwell in the desert in emulation of Elijah the zealot; as one who imitated the angels, you were made known to the world by Saint Anthony the Great. Righteous Paul, entreat Christ God to grant us His great mercy. This entry was posted in Education, Sunday to Sunday with DCE on January 11, 2015 by gldstrm.